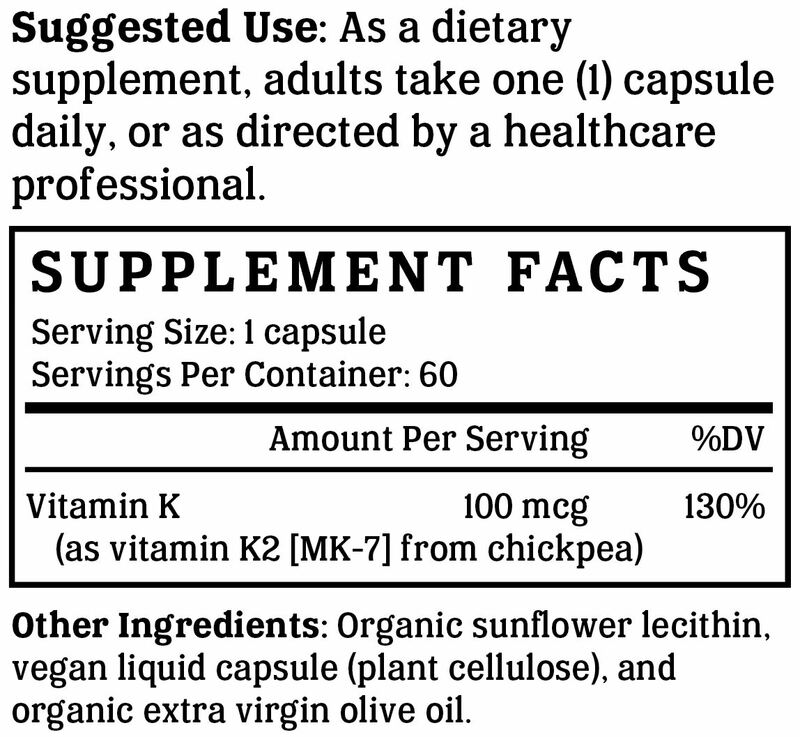 Vitamin K2 Gold is formulated using a solvent-free extract of K2 (as MK-7) from chickpeas. Vitamin K2 Gold is a vegan vitamin K2 product that is available in vegan liquid capsules and synergistically formulated with organic olive oil for superior bioavailability. Vitamin K2 Gold is manufactured in the USA to industry-defining quality standards and is verified by independent third-party labs to meet identity, purity, and potency label claims. Message From Staff: The vitamin K2 MK-7 as MenaQ7 that we now use is the most widely researched vitamin K2 available in its most bioavailable form. While MenaQ7 is available from a natto source, they also offer a variant grown on chickpeas. The only difference between these two ingredients is the vegetable matter on which the vitamin K2 is grown. Because natto sources can trigger soy allergen concerns, we made a conscious choice to use the chickpea-grown variant. Vitamin K is a fat-soluble vitamin that cannot be built by the body, so it must be obtained through diet or supplementation. Vitamin K facilitates calcium absorption for strong bones, encourages positive heart and kidney function, and supports healthy aging. The three forms of vitamin K are vitamin K1 (phylloquinone), vitamin K2 (menaquinone), and vitamin K3 (menaphthone). Vitamin K3 is a synthetic form of vitamin K that can cause liver toxicity and is not available as a dietary supplement. Vitamin K1 is synthesized by plants and is known as a plant source of vitamin K. Vitamin K1 is present in relatively high amounts in green, leafy vegetables (e.g. kale, spinach) and most individuals get some amount of vitamin K1 from their diet. However, vitamin K1 is not as biologically active as vitamin K2. 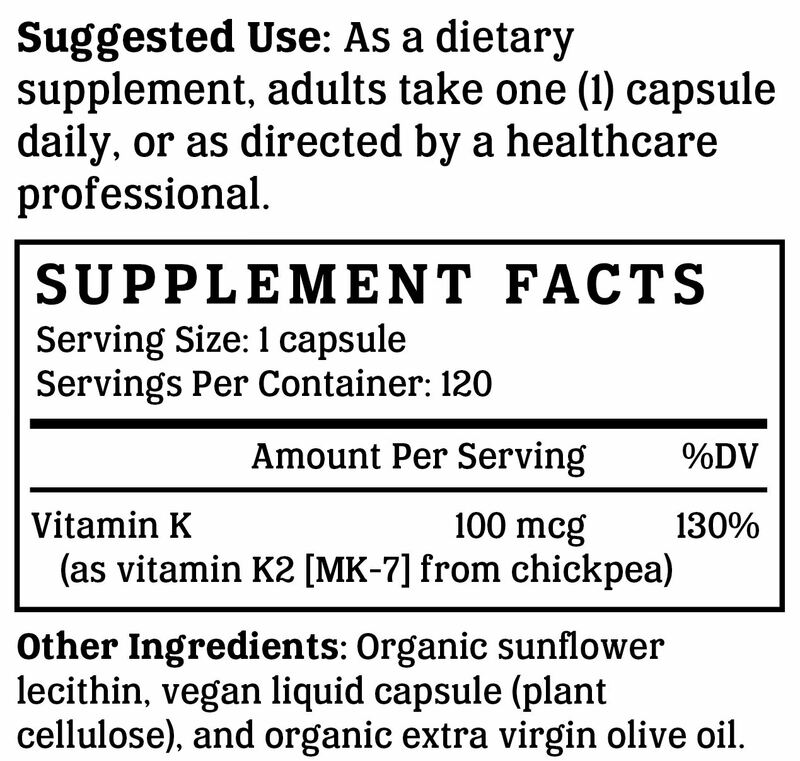 Vitamin K2 (as MK-4) is the most common form of K2 in animal products, but it is in synthetic form in supplements. The problem with MK-4 is that it has a very short half-life in the body (about 1 hour), which means frequent supplementation is required to maintain adequate vitamin K2 levels. Vitamin K2 (as MK-7) is the most bioavailable and biologically active form of vitamin K2. This form of K2 is naturally present in high amounts in the Japanese food, natto, which is made with fermented soybeans. MK-7 has the highest biological half-life, which means it is available for use by the body over a longer period of time and ensures consistent blood levels of the vitamin. Vitamin K2 MK-7 Gold is Non-GMO Project Verified, which provides assurance that the product has been manufactured in accordance with the best practices for GMO avoidance. The Non-GMO Project is North America's premier verification program. Vegan Action has offered vegan certification since 1995. Their official seal is proof that Vitamin K2 MK-7 Gold does not contain ingredients derived from animals or animal by-products, is free of animal-derived GMOs or genes, and is not the subject of ongoing animal testing. We like to make supplements that can be enjoyed by everyone. That's why our products are always compliant with the best practices for avoiding allergens and minimizing cross-contamination. Vitamin K2 MK-7 Gold is free of soy, gluten, egg, milk, peanut, shellfish, and corn allergens. Consistent with our guiding principle to “do no harm,” Vitamin K2 MK-7 Gold is manufactured without the use of additives or preservatives. It contains absolutely NO contaminants, pesticides, herbicides, harmful additives, residual solvents, magnesium stearate, or hexanes. Like all NutriGold products, Vitamin K2 MK-7 Gold is subject to over 140 purity and potency assays by independent, third-party labs to ensure that the product meets or exceeds its claims. So, you can be certain that what's on the label is what's in the bottle. Nothing more, nothing less.